This place is amazing. 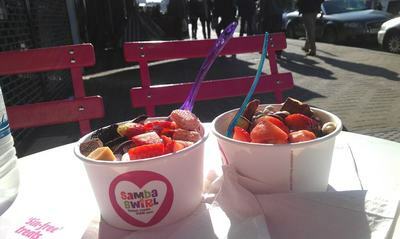 I stumbled across Samba Swirl with my friend one Sunday afternoon when the sun was out and even though it wasn't yet warm, we went inside, filled our pots and sat wrapped in coats in the sunshine. This place gets very popular in the summer but perfect for all year round as they also have seats inside. 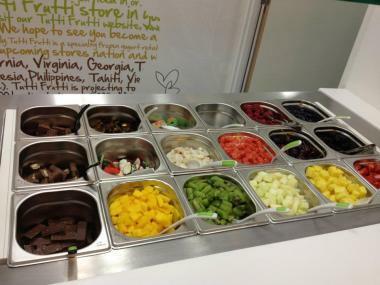 I love how you can mix and match your toppings as well as the yogurt flavours which they change daily. You can be as healthy or as unhealthy as you like here with their huge range of different chocolate topping, sweet topping but loads of fruit too. Just watch out on loading up because it is done by weight rather than per pot. Currently two locations, one in Clapham and one in Islington, are worth the trip, and are one of the only self-service places I have come across (although the staff that take your money are very lovely and helpful too). 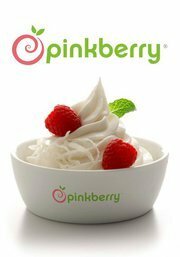 Pinkberry's frozen yoghurt is just delicious and the best thing is, the pots aren't done on weight, just as much as the server can fit in for you. They have a huge range of great tasting products that are made fresh with the highest quality ingredients. Their menu includes Original, Pomegranate, Chocolate, Mango, Coconut and Green Tea frozen yogurts, daily cut fresh fruit and seasonal fresh fruit toppings, as well as dry and liquid toppings of chocolate and caramel. I like the one in Selfridges Food Hall as the staff are really friendly. They always try and fill up your pot as much as possible. It's perfect for a little shopping break. However, they do have places all over the world. Still want your frozen fix in the cold weather? 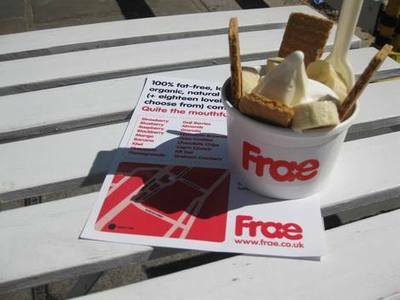 Frae has come up with a collection of 'Winter Warmers' including hot own-made apple crumble topping, fresh from the oven. All-organic ingredients and generous portions make it well worth breaking up your antiques hunt over in Islington. 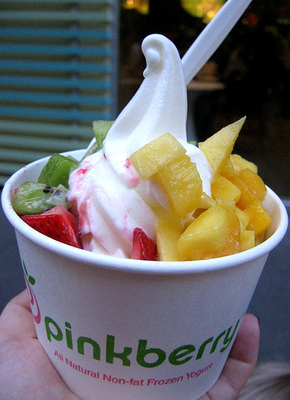 The frozen yogurt has a creamy, rich, more mellow taste compared to Snog or Pinkberry, which is very enjoyable. The strawberry one is the best (in my opinion), and a small cup is more than enough for me. 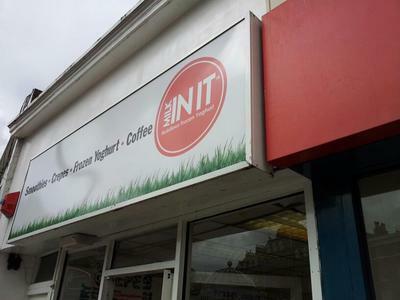 They have two locations in London at the moment but there's hoping they open more. Ambient music, a (fake) lemon tree and turf instead of carpet give a travellers' café air to this relaxed yogurt, juice and smoothie bar. 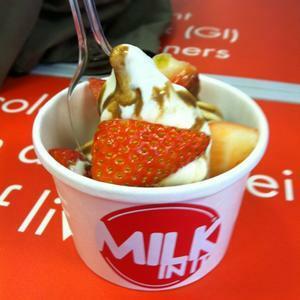 Try Moosh's frozen yoghurt with a luscious chocolate brownie topping dripping in rich chocolate sauce, it's just amazing. You can check out their full menu on their website before you arrive, too, if you fancy planning what to have. When I went there, I asked the staff about calories and they were more than happy to answer my question and were able to say the regular is 137 calories. A regular with one topping starts at £3.80 which is alright in terms of value, could be cheaper but it's not off-putting. So I went for a regular with blueberries (as usual) and sat down to taste. It had a creamy texture with a subtle taste that went down well with me and I would definitely go again. Moosh is a prime example of a place to hang out and chill. 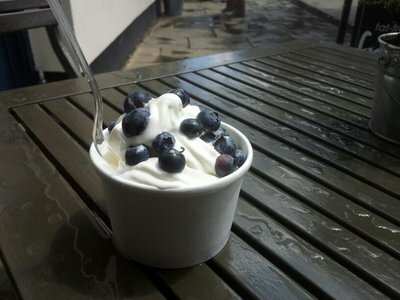 If you want to have something else with your frozen yoghurt you will have an excellent selection of foods to go with it. Sitting on fairy toadstools reading the exuberant slogans adorning the walls is half the fun of Snog's eat-in charm. With toppings from healthy nuts to sinful hunks of chocolate brownie on top of unflavoured, green tea or chocolate yogurt, you certainly will fancy a Snog. 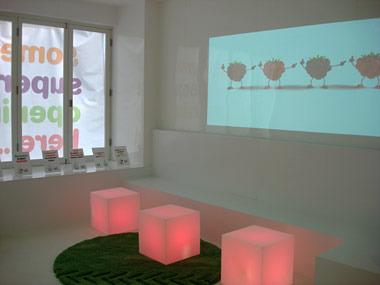 At Snog, the concept is extremely simple. All they serve are fat free frozen yogurts with minimal amounts of calories, and you choose from 3 base frozen yogurts: natural, green tea, and chocolate. Once you have chosen your base yogurt, you are presented with a dizzying array of topping choice, ranging from fresh fruits like strawberries and kiwi to dry toppings such as standard nuts to more exotic toppings like mochi (a Japanese type of marshmallow) and coconut shavings, and finally to decadent toppings of cookies, brownies, and Oreos. There are rather a lot of Snog's in London now, but I tend to head to the one in Soho when I want my little Frozen Yoghurt Snog treat. 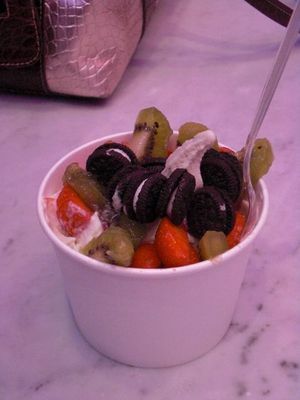 Newest to the frozen yoghurt craze is Yog. 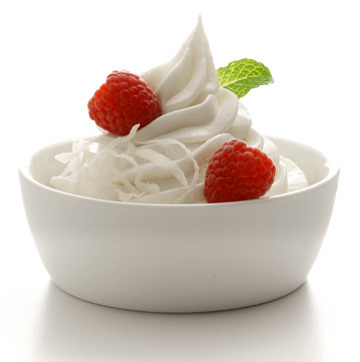 Claiming its probiotic credentials make it the perfect healthy yet sweet treat. 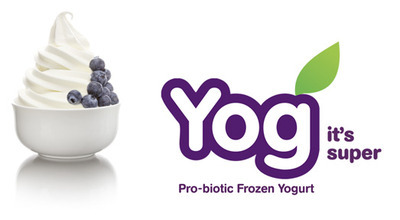 Yog offers beautiful creamy yogurt, easily mistaken for ice cream. On the menu: natural or dark chocolate with more than twenty toppings, including granola, banana chips, honey and fruits bought daily from New Covent Garden market. Seasonal options include hot Bramley apple and Christmas pudding. The chilled treats are all natural, fat free, and made with organic skim milk (no plans to supersize ourselves, thank you). 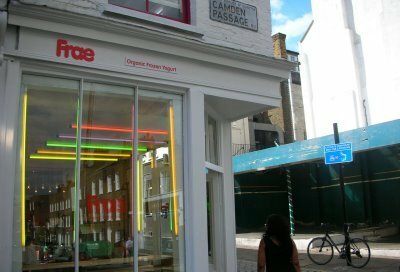 There are two stores now in London although my favourite is the one on Charlotte Street, Fitzrovia for its brilliant atmosphere and "funky" seats. 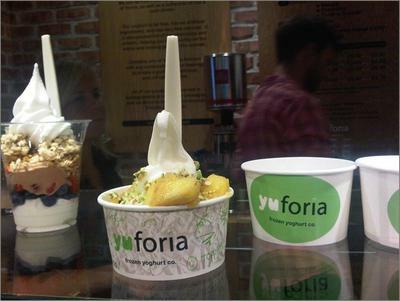 Given the tart yet creamy yogurt, the queue to enter this beautifully decorated frozen yogurt shop, Yu-foria, is no surprise. 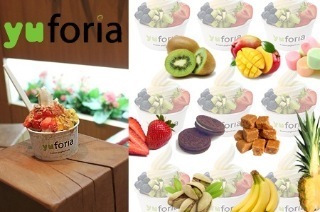 The 'Yu-foria special' flavour changes weekly, and usually comes with a hint of fruit, giving you the perfect excuse to go back and try the latest. They are based in Covent Garden and Soho so perfect for a little treat after a day's shopping. I can see many of my pounds financing Tutti Frutti over the summer as it is very close to my office and is a very new shop that only opened a few months back. It can get a little out of hand since you serve yourself and it's £1.70 per 100gm so be careful. I was pleasantly surprised by the grape and lychee flavours but they have a huge range of other flavours on offer too. This place is spacious and there is a huge seating area downstairs so take a quick break if you're walking down the Strand and treat yourself. It's healthy. Milkinit is an innocent looking shop sat inconspicuously off Clapham High Street but it's proved popular with the locals, judging by the long queues. Its walls are decorated by London wall art collective 'ifreecans' and feature swirls and clouds, while the yogurt itself is sweet but has a nice, tangy aftertaste making it the perfect vehicle for some sugary toppings, such as chocolate buttons or mini marshmallows. There are also crepes and waffles to satisfy the really sweet tooth. Friendly service, generous portions and a loyalty card system make for the perfect treat. It really does taste great, apparently because they sweeten the yoghurt with Agave Nectar, a plant extract that offers sweetness like sugar but with low GI and only half the calories. Take a look at the menu here for the vast choices. A lot cheaper than some other places too, this one is definitely worth visiting. 'So good it yoghurts' is the catchy slogan of Frog Frozen Yoghurt Bar and who can argue with that? 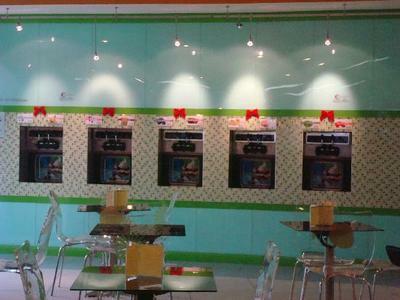 If it's not the eye-catching neon décor that entices you into this place, then it will be the luscious frozen yogurt on offer. First, choose whether you want a yogurt or a 'yogshake', select your flavour, and then finally face the daunting challenge of choosing between all the toppings. How does warm custard sound? Or pink shrimp foam sweets? 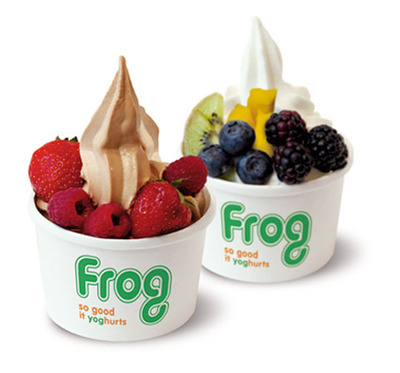 Frog is located right next to Bayswater tube station and open until 1am for any late night frozen yoghurt hunters. If you're a student, they offer a buy 1 get 1 free deal which is well worth making use of. Have a look at their menu here and go along for the visit.